Meg and I finally managed to get married in early December. It was the kind of wedding we both wanted: it was small, and we held it at Gran’s, the local restaurant that Meg helped found, run by two people who have become our friends, with our relatives and local friends around us. Meg’s mentor Christopher officiated (under a special license), the weather cooperated, and a good time was had by all. At least, nobody complained, and the food was great. And then we woke up a few days later and realized we hadn’t even thought about a honeymoon. The time leading up to the wedding was crazy busy for both of us—Meg wrapping up the last of her apple harvest, me trying like mad to finish up my constructions projects before the snow started. And we got all that done, and a bit more, before the wedding. But once we came up for air, we realized that there would never be a better time for a honeymoon, because there was nothing that had to be done in either of our jobs for a few months. So we sat down and started making a list of places we wanted to go, that were easy to get to and wouldn’t break the bank, and we decided to drive to Monticello, because of Thomas Jefferson’s love for his orchard and the amazing building he designed—something for each of us. We made the first half of the trip with no problems, and with a few interesting stops along the way. We enjoyed the tour of Monticello, and paid homage to Jefferson, who’s buried on the property. That night Meg got a phone call from her parents in New Jersey. If you’re guessing that meant trouble you’d be right: when the Coreys got back home after the wedding, they found a body in their back yard, and it turned out to be someone they knew: their handyman, who’d been keeping an eye on the house while they were away. And then things got a lot more complicated. The good news is, Meg and I are still married. If you can spend a week with the parents of your beloved spouse and solve a murder at the same time, you’ve got a pretty solid marriage. But it’s great to be back in Granford! The “honeymoon” book, Seeds of Deception, will be released in October. I’ll be happy to hold a drawing for a copy whenever it appears, but if you can’t wait that long, you’re welcome to choose a copy of A Gala Event (that’s the “wedding” book) or any of the earlier books in the series. A lot has happened between Meg and Seth since Meg arrived in Granford! If you'd like to preorder Seeds of Deception, you can find it at Amazon and Barnes and Noble. What fun....a honeymoon and mystery combined! Not exactly the way they'd planned to spend their time! A new to me series. I can't wait to try it. Thanks for the chance. I can't wait to read Seeds of Deception. My book is on pre-order. I love this series and have Seeds of Deception on pre-order. Thanks for the chance to win a copy! kimdavishb (at) gmail (dot) com. Glad the wedding went off without a hitch, finally. coming in October. that's not that far away. I think spending a week with the parents might be harder than solving the murder! Looking forward to the release. I love this series and if chosen will happily wait for Seeds of Deception to be released. What a fun post! I like the idea of their honeymoon incorporating orchards and history! Thanks! Want to read the whole series. Enjoyed the post. Sounds like a great read. Thanks. What's a great post,I really enjoyed it. 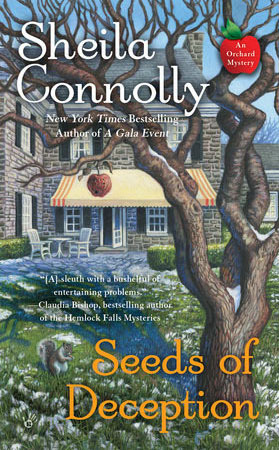 This is a great series, really looking forward to reading "Seeds of Deception". Thanks for the chance. I love that Meg and Seth moved forward with their relationship and got married. Too many cozy authors drag the love interest way too long. It is the mark of a good writer/storyteller to move their characters along. No big surprise that Sheila Connolly did this. She is an excellent storyteller. I look forward to this next book. I would love a chance to win a copy for my daughter. I have mine on preorder. Thank you, Annette! It took Meg and Seth only two years (and ten books) to get to the altar, so they weren't rushing things. I hope they have changed and grown in that time. So much fun thank you. What a great series! I'm not sure I can wait for the new book...it sure will be worth the wait! Sounds great...body in the backyard my cup of tea. Thanks for the contest.